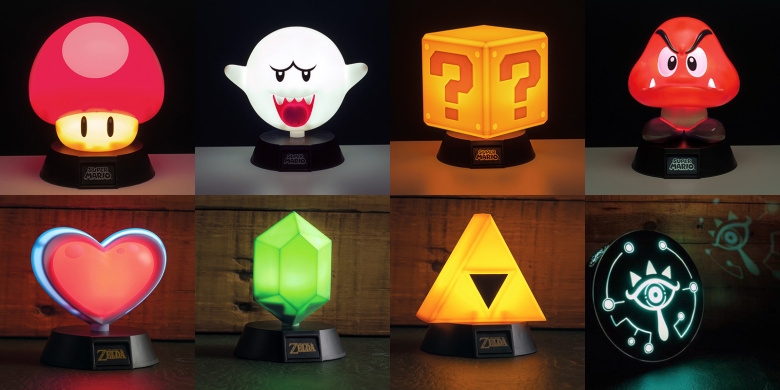 Merchoid, an official videogame merchandise retailer, has revealed they are bringing a new range of officially licensed Super Mario and Zelda 3D Lights. These are based on iconic characters and items that are from these classic Nintendo games and are all available to pre-order while stock lasts. The Super Mario Light range features 10cm high mini lights based on the red mushroom power-up,Goomba Boo, Question Block and Goomba. They are all valued at £12.99/€14.99/$16.99 each. The Legend Of Zelda Light range features 10cm high mini lights based on a Heart Container, Green Rupee and Triforce. They are also valued at £12.99/€14.99/$16.99 each. The most interesting and larger than the others (25cm high) is the Out of the Shadows Sheikah Eye Projection Light. It is a circular light with the Sheikah Eye Symbol as seen in Zelda: Breath Of The Wild. It has a cut-out design that allows a blue light to shine ouf from with in and project the Sheikah eye Symbol onto any surface. This badboy will set you back £32.99/€34.99/$39.99. 8 Brand new products based on Nintendo and Zelda videogames.